The Bloomington Symphony Orchestra invites you to an afternoon of great music on Sunday, February 16 at 3 p.m. The concert begins with Wagner’s Overture to Rienzi, followed by Mozart’s Violin Concerto No. 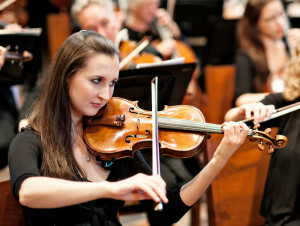 5 in A Major, performed by our concertmaster, Rebecca Corruccini. The program concludes with Symphony No. 2 by Sergei Rachmaninoff. Maestro Manny Laureano thinks that the second movement is so romantic, you might want to bring a date! Wrap up your Valentine’s weekend with a concert of beautiful music. Ticket information can be found here. Keep an eye on this page for Manny’s Musings, a preview of the concert music.